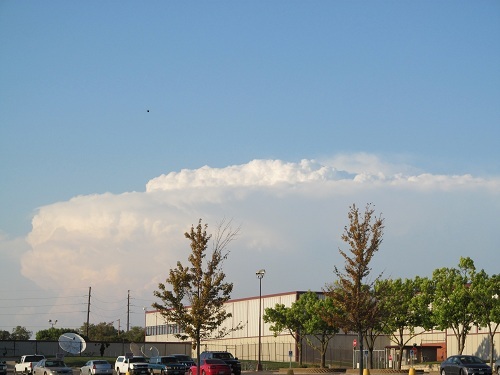 Sky looking north over Rockwell-Collins in Cedar Rapids on Tuesday. Tuesday on the way home, I shot the picture of the unsual looking cloud off to the north. There was a chance of rain that night, but it looked sadly as if the rain was staying out of Cedar Rapids. However, last night storms rumbled through and dumped a fair amount of rain. This morning I was unsure of biking into work—should I take a chance or should I drive? I rode my bike, and it sprinkled on me and I got a bit damp. 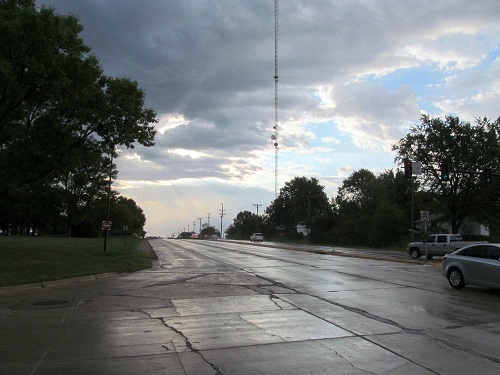 But, just about ¼ mile south of my house, where F Avenue NE crosses Collins Road to enter Rockwell-Collins parking lots, the rain abated—I was traveling south of a narrow band of rain that remained to my north. And the sky just looked very interesting, with the sunrise peeking around the clouds. I noticed that there was water running in Dry Creek again. I won’t have to water my gardens for a couple of days, and that’s nice. And the interesting skies were good to look at, too. Wednesday morning, looking east along Collins Road at F Avenue NE in Cedar Rapids.